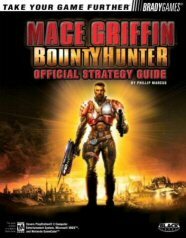 BradyGames' Mace Griffin Bounty Hunter Official Strategy Guide provides a complete step-by-step walkthrough to take players through the game. Expert mission strategies to successfully complete every objective. Detailed maps guide players through the massive levels. Comprehensive coverage of the various ships and races. Complete weapon and equipment rundown to help gamers defeat enemies.